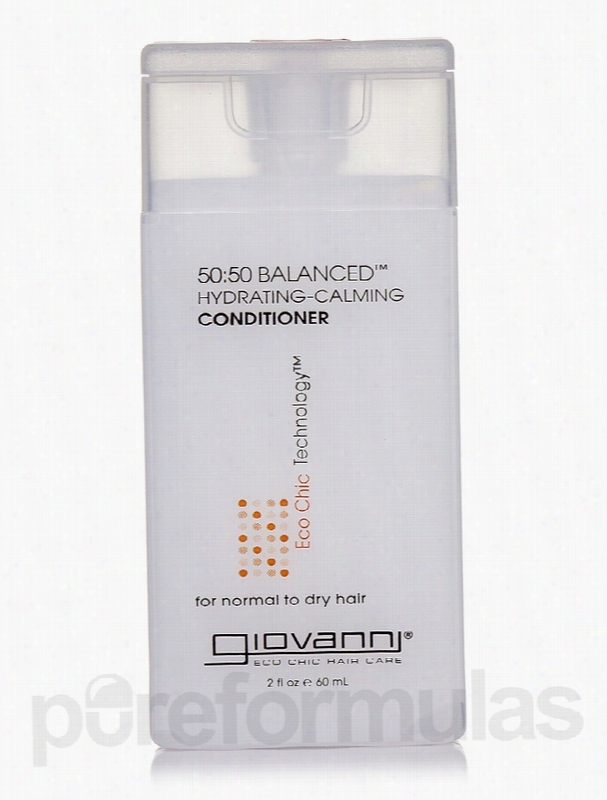 Giovanni Cosmetics Hair - Hydrating-Calming 50/50 Balanced Conditioner. Hydrating-Calming 50/50 Balanced&trade; Conditioner for normal to dry hair 2 fl. 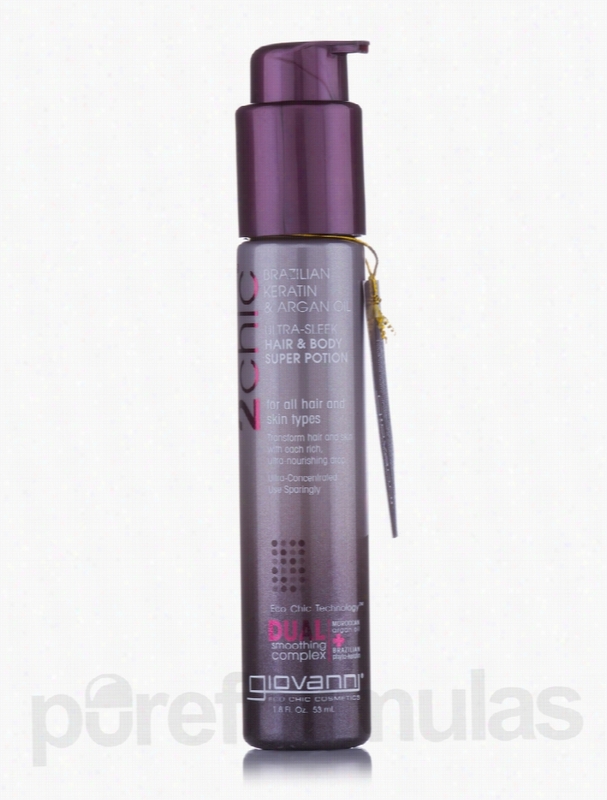 oz (60 ml) from Giovanni&reg; Cosmetics may help maintain worked up or chemically subjected hair. It may also help retain hair&rsquo;s color and impart shine to the tresses as well. Studies indicate that over treated hair may result in dryness and damage. Ingredients like stearyl alcohol&sbquo; cetyl alcohol and glycerine are known for their moisturizing effects. They may help moisturize dry and damaged strands. Sunflower seed oil and aloe vera juice may add suppleness&sbquo; hydrate your hair roots and keep them moisturized. Birch extracts may help combat hair loss. Mallow extracts contain flavonoids which are anti-inflammatory in nature and so&sbquo; may keep scalp infections at bay. Chamomile flowers nettle and rosemary leaf extracts are blended together in this conditioner from Giovanni&reg; Cosmetics&sbquo; which may stimulate hair growth. Lavender extracts in the conditioner may help calm down itchy scalp conditions&sbquo; which is usually natural to chemically subjected hair. Clary and thyme in Hydrating-Calming 50/50 Balanced&trade; Conditioner for normal to dry hair 2 fl. oz (60 ml) from Giovanni&reg; Cosmetics may help prevent hair loss&sbquo; while coltsfoot may strengthen and condition your hair. These statements have not been evaluated by the Food and Drug Administration (FDA). These products are not meant to diagnoseÃ¢ÂÂ treat or cure any disease or medical condition. Please consult your doctor before starting any exercise or Nutritional supplement program or before using these or any product during pregnancy or if you have a serious medical condition. Giovanni Cosmetics Hair - Ultra-Sleek Hair & Body Super Potion - 1.8. Ultra-Sleek Hair and body Super Potion from Giovanni&reg; Cosmetics is a unique formula suitable for all types of skin and hair. This plant based preparation contains organic ingredients that could improve the overall health of your hair and skin. Grape seed oil contains vitamin C&sbquo; linoleic acid&sbquo; protein&sbquo; and Minerals that are needed to fortify the scalp. Other benefits are that it moisturizes the scalp and skin&sbquo; seals in moisture&sbquo; conditions the hair and gives it a healthy sheen. Brazilian Cocoa keratin extracts present in this vegetarian formulation from Giovanni&reg; Cosmetics help restore damaged hair&sbquo; condition the scalp and manage frizzy hair. By supporting the body&rsquo;s antioxidant system&sbquo; they could also boost skin health. Argan oil extracted from the Moroccan argan tree is rich in fatty acids and vitamin E that could moisturize the skin and give it a healthy look. It conditions the hair&sbquo; treats split ends and makes hair attractive&sbquo; shiny and easy to style. Switch to Ultra-Seek Hair and Body Super Potion from Giovanni&reg; Cosmetics to enhance your hair and skin health. These statements have not been evaluated by the Food and Drug Administration (FDA). These products are not meant to diagnoseÃ¢ÂÂ treat or cure any disease or medical condition. Please consult your doctor before starting any exercise or nutritional supplement program or before using these or any product during pregnancy or if you have a serious medical condition. Giovanni Cosmetics Hair - Magnetic Restruxturing Conditioner - 8.5 fl.. 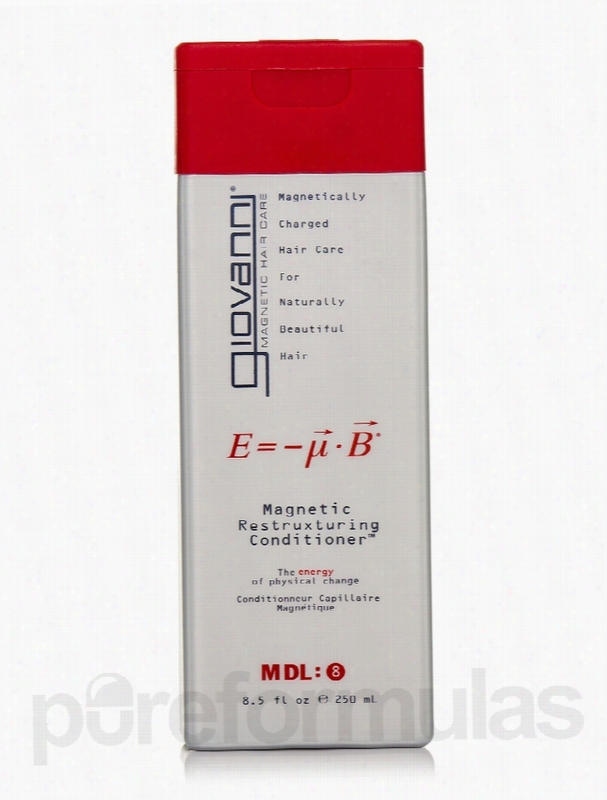 Magnetic Restruxturing Conditioner&trade; from Giovanni&reg; Cosmetics may repair and restore damaged hair. A combination of nature and science could help recoup the condition of damaged hair. This hair conditioner from Giovanni&reg; Cosmetics contains a combination of organic ingredients. Cetyl alcohol along with stearalkonium chloride may help spread the conditioner throughout the hair&sbquo; while the botanicals sunflower and rosemary leaf extracts appear to add shine to the strands. With adequate amounts of protein and moisture-rich molecules&sbquo; the hair conditioner also contains other natural extracts like clary&sbquo; coltsfoot and sage leaves which may condition and smoothen out hair from root to tip. Soybean&sbquo; thyme&sbquo; olive oil and lactoferrin extracts add to the effectiveness of this conditioner. Use this conditioner and it may help smooth the mane and add on to the protein content&sbquo; thus bringing back dull hair to life. If you often end up exposing your hair to chemical treatments&sbquo; get Magnetic Restruxturing Conditioner&trade; from Giovanni&reg; Cosmetics and it may help you find a way to having a silky smooth hair texture. These statements have not been evaluated by the Food and Drug Administration (FDA). These products are not meant to diagnoseÃ¢ÂÂ treat or cure any disease or medical condition. Please consult your doctor before starting any exercise or nutritional supplement program or before using these or any product during pregnancy or if you have a serious medical condition. Giovanni Cosmetics Hair - Ultra-Sleek Conditioner - 8.5 fl. oz (250. 2chic&reg; Ultra-Sleek Conditioner for all hair types from Giovanni&reg; Cosmetics may nourish hair and make hair silky&sbquo; smooth and enviable. The Ultra-Sleek Conditioner contains Eco Chic Technology&trade; and may promote lustrous hair with ease. Brazilian Keratin &amp; Argan oil are present in this hair conditioner from Giovanni&reg; Cosmetics and may add shine and Health to hair and control frizz. Brazilian Keratin &amp; Moroccan argan oil potentially works like magic on the hair and delivers high gloss results instantly. They may also detangle and moisturize the hair effectively. The other highly moisturizing ingredients like jojoba oil&sbquo; pro-vitamin B5&sbquo; aloe vera and coconut oil may strengthen the hair follicles and nourish your hair. Rooibos tea and macademia seed extracts may inhibit infections. They may also stimulate the follicles from deep inside. 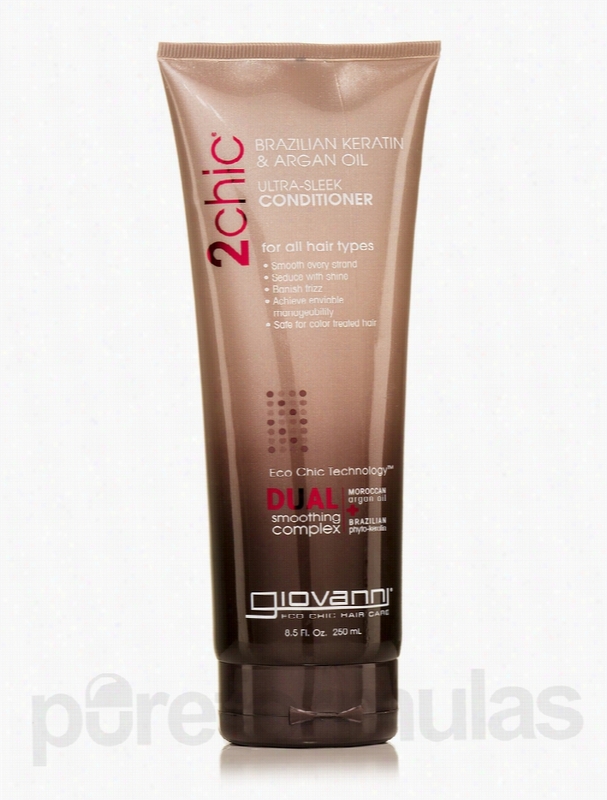 2chic&reg; Ultra-Sleek Conditioner for all hair types from Giovanni&reg; Cosmetics may be safe to use on color treated hair as well. These statements have not been evaluated by the Food and Drug Administration (FDA). These products are not meant to diagnoseÃ¢ÂÂ treat or cure any disease or medical condition. Please consult your doctor before starting any exercise or nutritional supplement program or before using these or any product during pregnancy or if you have a serious medical condition. Giovanni Cosmetics Hair - Shampoo Smooth As Silk - 2 fl. oz (60 ml). 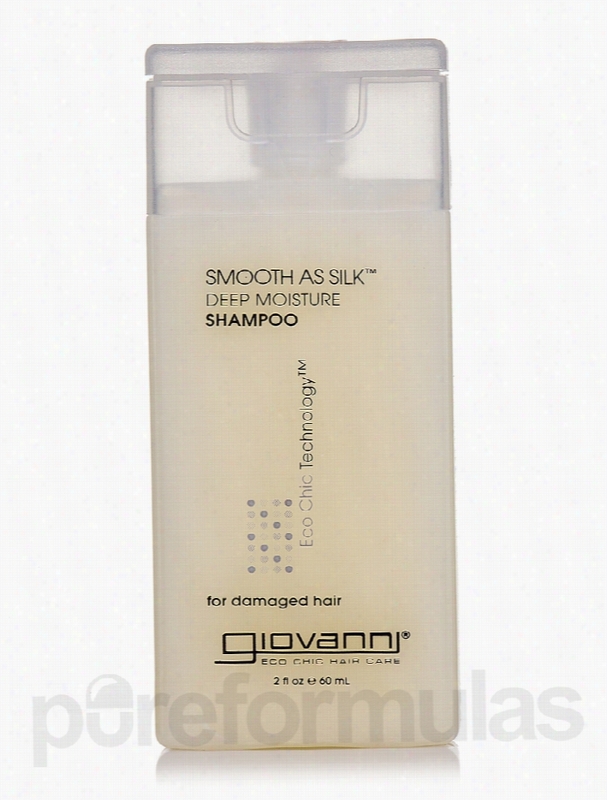 Shampoo Smooth As Silk&trade; Deep Moisture from Giovanni&reg; Cosmetics may infuse proteins into hair to repair damaged hair. Vegetable proteins have better surging power than animal proteins&sbquo; and so chamomile and grapefruit extracts may provide proteins to the hair strands. Lemongrass extracts and Echninacea appear to have moisturizing effects on the scalp and hair to leave your hair manageable and moisturized. Lavender extracts in the shampoo may soothe and relax the scalp&sbquo; while soybean and rosemary leaf may hydrate hair roots and root bulbs. Sea kelp&sbquo; mango and willow bark extracts may moisturize hair and ensure protein penetration into the hair follicles. Using Eco Chic Technology&trade;&sbquo; this shampoo from Giovanni&reg; Cosmetics also contains foaming proteins like Cocamide MEA&sbquo; Glycol Distearate and Decyl Glucoside which may clean the hair and give it a glossy look. Buy Shampoo Smooth As Silk&trade; Deep Moisture from Giovanni&reg; Cosmetics that may recoup and restore proteins into damaged hair. These statements have not been evaluated by the Food and Drug Administration (FDA). These products are not meant to diagnoseÃ¢ÂÂ treat or cure any disease or medical condition. Please consult your doctor before starting any exercise or nutritional supplement program or before using these or any product during pregnancy or if you have a serious medical condition. 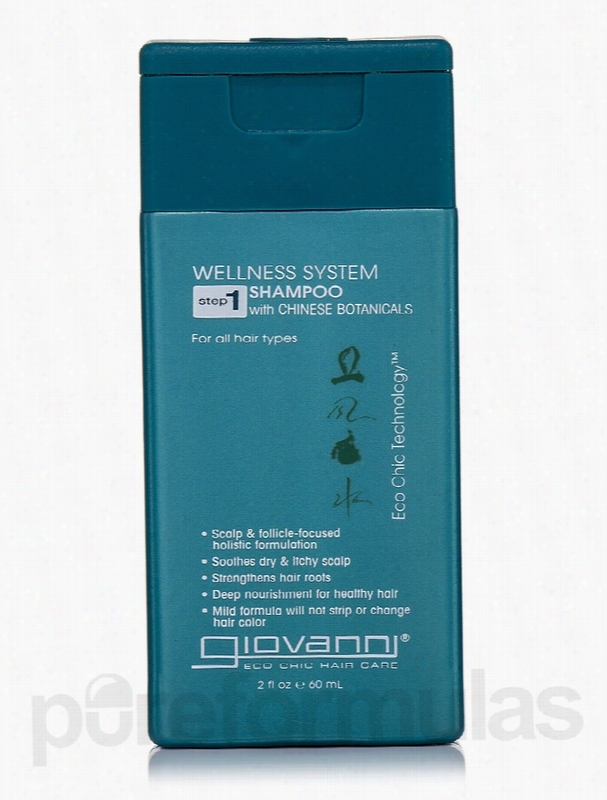 Giovanni Cosmetics Hair - Wellness System Shampoo (Chinese Botanicals). Wellness System Shampoo for all hair types from Giovanni&reg; Cosmetics may function as a hair and scalp care shampoo. This wellness shampoo contains Chinese botanicals to provide a complete Hair Care solution. Aloe vera leaf juice may help the hair draw in adequate amounts of moisture. Sesame seeds contain sesame oil&sbquo; which may strengthen the roots of your hair and make your hair shiny and healthy. Chinese botanicals like Hei Zhi Ma&sbquo; An Mole and Mo Han lian may restore moisture in the dry scalp. They may also calm itchy scalp conditions. Fruit&sbquo; flower and leaf extracts like Wu Huan Zi&sbquo; Jia Ma Chi Xian&sbquo; Mulberry&sbquo; Saw Palmetto and Matricaria may infuse deep conditioning and nourishment to make your hair healthy and strong. Other well-known extracts like ginsensides&sbquo; nettle&sbquo; green tea&sbquo; peppermint&sbquo; and sunflower seed oil may act as astringents to tighten the hair follicles and prevent them from accumulating grime. These ingredients in the shampoo from Giovanni&reg; Cosmetics may stimulate hair growth. For a one-stop hair solution&sbquo; buy Wellness System Shampoo for all hair types from Giovanni&reg; Cosmetics. These statements have not been evaluated by the Food and Drug Administration (FDA). These products are not meant to diagnoseÃ¢ÂÂ treat or cure any disease or medical condition. Please consult your doctor before starting any exercise or nutritional supplement program or before using these or any product during pregnancy or if you have a serious medical condition. Giovanni Cosmetics Hair - Magnetic Force Styling Wax - 2 oz (57 Grams). 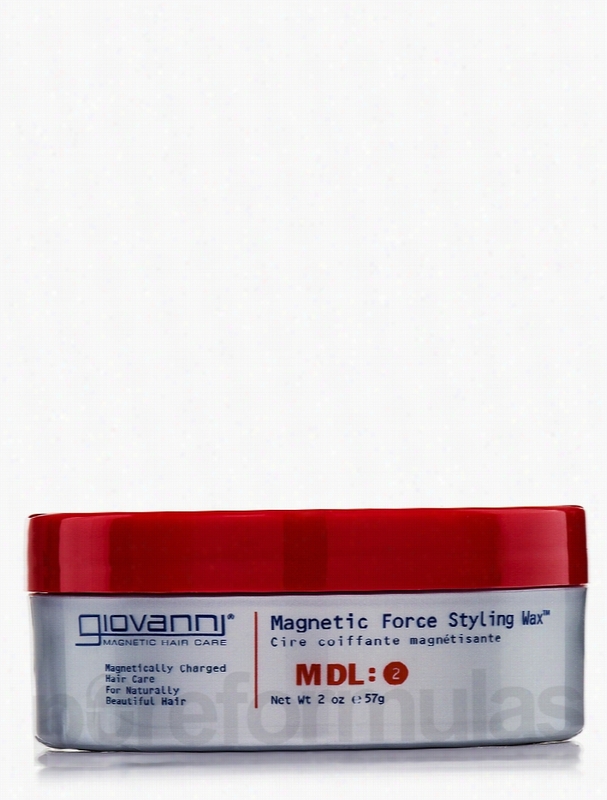 Magnetic Force Styling Wax&trade; 2 oz from Giovanni&reg; Cosmetics may help tame and help hold your hair great. People believe that the hair styling wax is formulated with magnetically charged hair care technology&sbquo; which might suit all hair types. It may not leave behind any build-up and keep your hair secured and in place. The hair wax from Giovanni&reg; Cosmetics may not only help hold your just-done hair&sbquo; but also impart nourished shine to it. You may use this hair wax on your specially done hair-dos and may find that it stays in place all day long. Along with beautifully secured hair&sbquo; you may also find that the hair wax is not sticky on hair and may add detail to the strands. With just a little bit of Magnetic Force Styling Wax&trade; 2 oz from Giovanni&reg; Cosmetics&sbquo; you may make your hair appear smooth and set fine. These statements have not been evaluated by the Food and Drug Administration (FDA). These products are not meant to diagnoseÃ¢ÂÂ treat or cure any disease or medical condition. Please consult your doctor before starting any exercise or Nutritional supplement program or before using these or any product during pregnancy or if you have a serious medical condition. Giovanni Cosmetics Hair - Golden Wheat Shampoo - 8.5 fl. oz (250 ml). 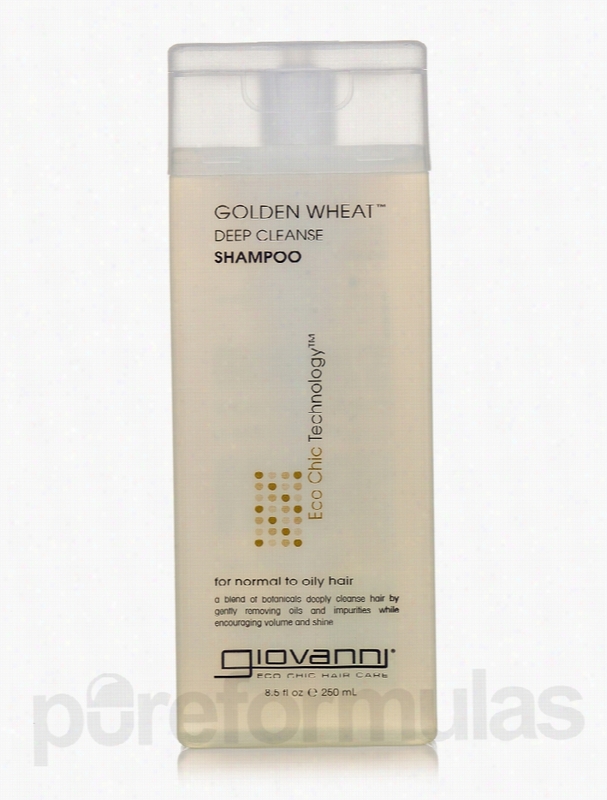 Golden Wheat&trade; Shampoo from Giovanni&reg; Cosmetics may protect and clean your scalp. This unique vegetarian formula&sbquo; apart from cleansing your hair and scalp by balancing natural oils&sbquo; also gives your hair more body and a shining appearance. This supplement from Giovanni&reg; Cosmetics is a soothing blend of botanicals like spearmint leaf oil&sbquo; aloe vera leaf juice&sbquo; sunflower seed oil and rosemary leaf extracts. Spearmint oil is an aromatic oil and it may stimulate the scalp. Aloe vera leaf juice present in this shampoo soothes the scalp and hydrates the hair. It also promotes softer hair. Sunflower seed oil contains omega 6 fatty acids that could retain the thickness of hair and moisturize the scalp. Rosemary leaf extracts could balance the scalp&rsquo;s oil production and improve hair growth. They also aid in enhancing the fragrance of the shampoo. Golden Wheat&trade; Shampoo from Giovanni&reg; Cosmetics may exhibit nourishing benefits and cleansing your hair and scalp and enhancing the overall look of your hair. These statements have not been evaluated by the Food and Drug Administration (FDA). These products are not meant to diagnoseÃ¢ÂÂ treat or cure any disease or medical condition. Please consult your doctor before starting any exercise or nutritional supplement program or before using these or any product during pregnancy or if you have a serious medical condition. Giovanni Cosmetics Hair - Root 66 Max Volume Lifting Spray - 8.5 fl..
Root 66&trade; Max Volume Directional Root Lifting Spray 8.5 fl. oz from Giovanni&reg; Cosmetics may help steer directional control in your hair. You may be able to lift and fix your hair&sbquo; and style it the way you want. With aloe vera leaf extracts in the lifting spray from Giovanni&reg; Cosmetics&sbquo; your hair may appear moisturized and hydrated. Nettle and rosemary leaf extracts may act as astringent and keep your scalp away from infections. They may also help maintain a healthy shaft. Rosa hips fruit extracts may condition your hair and may make it appear shiny and glossy. Blends of Wild Bergamot in the root lifting spray may help alleviate dry scalp conditions. It may make just-done hair appear tamed and smooth too. 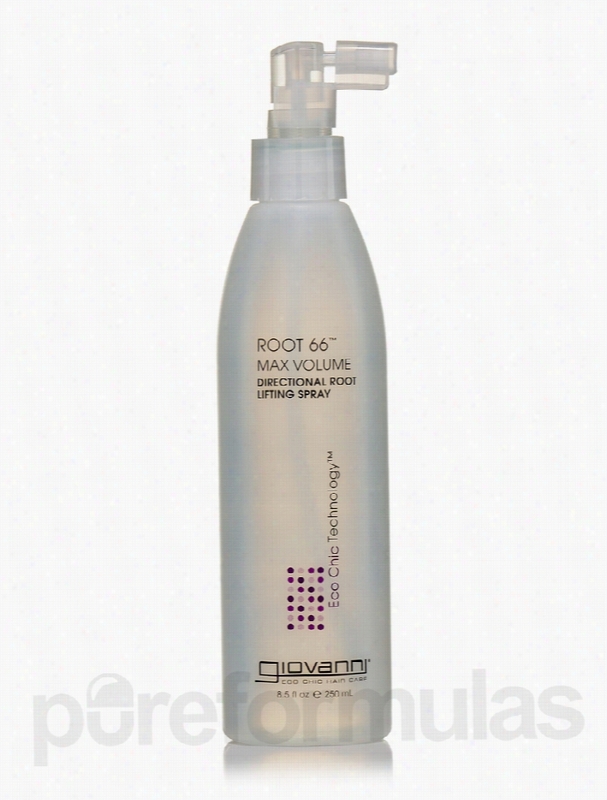 If you want to take control of your hair and fix it in the right style&sbquo; you may choose to buy Root 66&trade; Max Volume Directional Root Lifting Spray 8.5 fl. oz from Giovanni&reg; Cosmetics. These statements have not been evaluated by the Food and Drug Administration (FDA). These Products are not meant to diagnoseÃ¢ÂÂ treat or cure any disease or medical condition. Please consult your doctor before starting any exercise or nutritional supplement program or before using these or any product during pregnancy or if you have a serious medical condition. Giovanni Cosmetics Hair - Root 66 Max Volume Shampoo - 8.5 fl. oz (250. 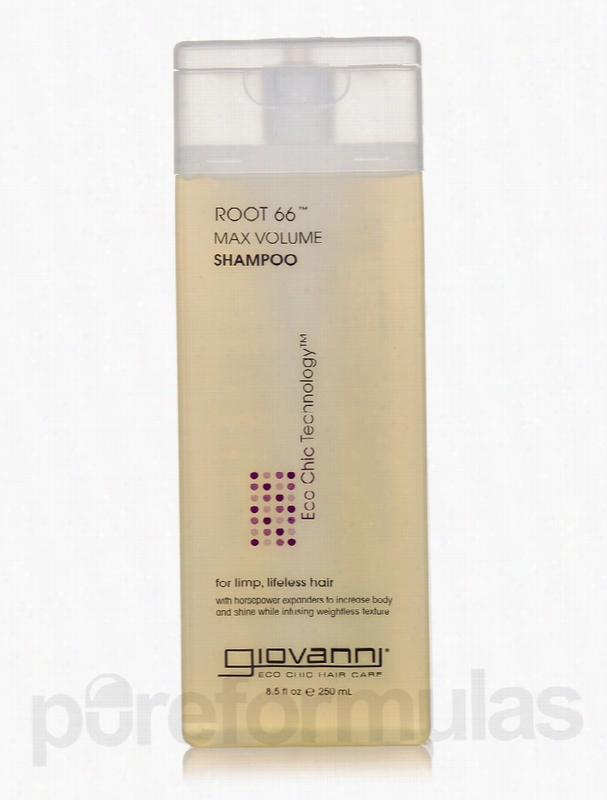 Enhance bounce and volume of limp hair with Root 66 Max Volume Shampoo Giovanni&reg; Cosmetics. Enriched with botanicals that cleanse&sbquo; hydrate&sbquo; heal&sbquo; and strengthen strands&sbquo; this shampoo may transform your look with every wash. Horsetail extract is full of nutrients that may accelerate hair growth. The high silica content in horsetail extract may boost hair strength and it may make hair follicles stronger and promote new growth. Papaya extract appears to nourish the hair shaft and improve volume. It may also boost growth by preventing hair loss&sbquo; controlling dandruff&sbquo; and removing excess sebum from the scalp. Kiwi extract in this volumizing shampoo from Giovanni&reg; Cosmetics is full of vitamins&sbquo; minerals and antioxidants that support a healthy and shin head of hair&sbquo; all while preventing hair loss and stimulating new growth. Aloe vera leaf juice in Root 66 Max Volume Shampoo from Giovanni&reg; Cosmetics moisturizes hair to give you smooth&sbquo; manageable and untangled hair. These statements have not been evaluated by the Food and Drug Administration (FDA). These products are not meant to diagnoseÃ¢ÂÂ treat or cure any disease or medical condition. Please consult your doctor before starting any exercise or nutritional supplement program or before using these or any product during pregnancy or if you have a serious medical condition.